1. After reading President Roosevelt’s words, listen to his address in the video under “Resources” below. What was the main idea of President Roosevelt’s prayer when he addressed the nation on the evening of June 6, 1944? 2. 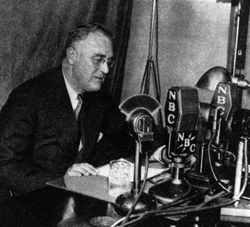 How do you think President Roosevelt’s address and speech to the nation inspired Americans? 3. a) Why do you think President Roosevelt acknowledged God, and prayed “help us, Almighty God, to rededicate ourselves in renewed faith in [You] in this hour of great sacrifice”? b) In his address, President Roosevelt asked the people to pray without ceasing. He said: “Many people have urged that I call the nation into a single day of special prayer. But because the road is long and the desire is great, I ask that our people devote themselves in a continuance of prayer. As we rise to each new day, and again when each day is spent, let words of prayer be on our lips, invoking Thy help to our efforts.” Why do you think he urged Americans to do this? 3. Listen to President Reagan’s speech on the 40th anniversary of D-Day (under “Resources” below). a) What was the tone of President Reagan’s speech? More than 5,000 Ships and 13,000 aircraft supported the D-Day invasion, and by day’s end on June 6, the Allies gained a foot-hold in Normandy. The D-Day cost was high – more than 9,000 Allied Soldiers were killed or wounded — but more than 100,000 Soldiers began the march across Europe to defeat Hitler. For FAQs on D-Day, go to ddaymuseum.co.uk/faq.htm. Before TV was available to the whole country (beginning in the 1950s), people got their news from newspapers, the radio, and newsreels that were shown in movie theatres.